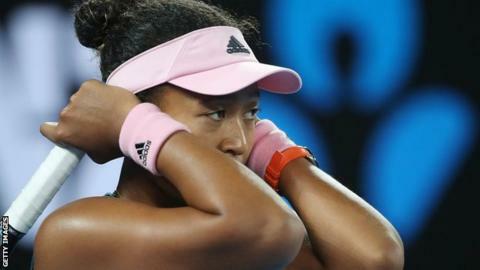 Japan's Naomi Osaka blamed scrutiny following the split from her coach for defeat in her first match since becoming world number one. The Australian and US Open champion, 21, was beaten 6-3 6-3 by France's Kristina Mladenovic in the Dubai Tennis Championships second round. It was her first match since splitting with Sascha Bajin last week. Asked if she could block out reaction to the news, she said: "I couldn't. This match is the result of that." She added: "I'm pretty sure as time goes on you guys will stop talking about it. For now, it's like the biggest tennis news, I guess. "It's a little bit hard because I feel like people are staring at me, and not like in a good way." Osaka, who had a bye in the first round, lost in 66 minutes in round two against a player who had not won a match this year before this tournament. They traded six successive breaks of serve before world number 67 Mladenovic, 25, held when serving for the match to set up a meeting with Spain's Carla Suarez Navarro in the third round. Second seed and two-time Wimbledon champion Petra Kvitova fought back from a set down to beat fellow Czech Katerina Siniakova 6-7 (3-7) 6-4 6-4 and reach the last 16. Germany's three-time Grand Slam champion Angelique Kerber saved two set points in the opener before winning 7-6 (7-4) 6-3 against Slovenia's Dalila Jakupovic. Russia's Viktoria Kuzmova overcame seventh seed Kiki Bertens 6-2 4-6 7-6 (8-6), while American Sofia Kenin progressed with a 6-3 2-6 6-4 victory at the expense of Russian 11th seed Daria Kasatkina. Taiwan's Hsieh Su-wei saw off Belarus' Aliaksandra Sasnovich 6-1 6-2.